If you’re looking for a Kosher wine and food tour, contact us today! Capçanes dates back to the 19th century and was one of the many victims of phylloxera in Spain. Wiped out and under resourced, it wasn’t until 1933 when 5 families joined forces to create the cooperative of Capçanes. Over the years, they grew at a steady pace, but it wasn’t until 1995 when a Jewish family from Barcelona requested that they make the first Kosher wine in Spain that times truly changed for Capçanes. As taken from their website, “This demanded the installation of new equipment allowing the winemakers to identify, isolate and vinify under controlled “Lo Mebushal” conditions, small parcels of quality fruit.” Consequently, the Peraj Ha’abib (Flor de Primavera or Spring Flower) was the wine that placed Capçanes on the map worldwide. According to the practice known as orla, the grapes of new vines cannot be used for winemaking until the fourth year of planting. After the first harvest, the field must lie fallow every seventh year. Each of these sabbatical years is known as shnat shmita. 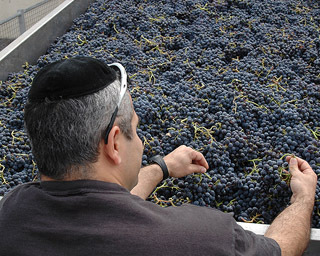 From the onset of the harvest, only kosher tools and storage facilities may be used in the winemaking process, and all of the winemaking equipment must be cleaned [sometimes up to 7 times with hot water] to be certain that no foreign objects remain in the equipment or vats. All of the materials (e.g. yeasts) used in the production and clarification of the wines must be certified as kosher. As explained by Inka Jechova, the winery guide, on strictly a winemaking level a Kosher wine proves to be a challenge to any winemaker. The winemaker may not have any contact with his wine other than through the Rabbi. Which means, that if the winemaker at Capçanes wants to check on his wine, he must ask the Rabbi to come in from Barcelona and take out a sample for him to both see and taste. On a very personal, I found the process fascinating and had wished the Rabbi was there so that I could ask him a few questions. I wanted to understand every detail of the winemaking process from start to finish. Does the winemaker give him a list of instructions? How many Sabbath-observant Jews decide to become full fledged winemakers? Is language an issue both on a very practical level, but also on a technical level? Currently, there are Kosher wines being made in DO Penedés (cava), Rioja, Priorat, Yecla, Montsant, Tarragona, Alella and Ribera del Duero. If you’re interested in getting more information on Kosher wine, you can head over to the Kosher Wine Society. As to the 2006 Peraj Ha’abib (not 2005 as indicated on the adjacent photo), it is made with 35% Cabernet Sauvignon, 35% Garnatxa Negra and 30% Samsó and aged for 12 months in new and one year old, mainly (honestly not sure what “mainly” means, because I didn’t think you could use a barrel that wasn’t Kosher, but that is what I was told) Kosher French oak barrels. Overall, we both enjoyed this wine immensely, but it is a monster wine that needs to develop. The wine is incredibly dark in color with a fabulous black cherry, chocolate and floral nose. In the mouth, the Peraj Ha’abib showed medium fine tannins, fresh acidity and a round mouthfeel, ebbing to a long, lush dark spice and red fruit finish. Definitely a fun wine, and worthy accolades, but as mentioned, lay this bottle for awhile before popping the cork.